Born in 1957 in Kushtia, Nasima Sultana grew up and received education in the town. She studied Bengali Language and literature at Rajshahi University. After completion of her MA she started her career as a journalist with the Masik Ganaswasthya. Later, she became a research assistant to the editor of the Weekly Holiday in Dhaka. Since 1987 she worked as an editorial assistant for the Dainik Janata and wrote for different magazines. She was married to another journalist Ahsanul Hakim Tutul. She fell seriously ill and died of cancer in Dhaka on 17 November 1997. 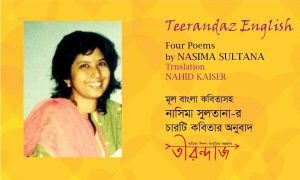 She is regarded as one of the most striking younger poets of Bangladesh. Life is not meant to be wasted over love-less love-makings! I will penetrate the barren jungle of Boliviya’s memory. Cannot see your face due to darkness Father! Your face is invisible in immense darkness Father! “God bless thee”, with a Catholic grandeur. Do you mean me inherit your gold-button and fountain pen ? I prefer to inherit Che’s timeless robe. Or in a secret meeting! What harm can there be in it ? Why should love be limited? প্রতিদিন নষ্ট সহবাসে ব্যর্থ হবে জীবন এমন হয় না হয় না! আামকে মুষ্ঠি-ভিক্ষা দেবে এক সেট সোনার বোতাম, ফাউন্টেন পেন? এত স্বল্প পরিসরে ভালোবাসা হয়?